Jimmy Fallon and Kevin Bacon perform on "First Drafts of Rock." Among the great harmony bands of the late 60s and early 70s, The Guess Who probably don't get as much love as they deserve. It's probably because they're Canadian, and they're best-known song is "American Woman," whose vintage opening chord progression and riff are unmistakable. They're also not on the level of The Who, who don't make you guess anything. What's the best way to give this band its due? 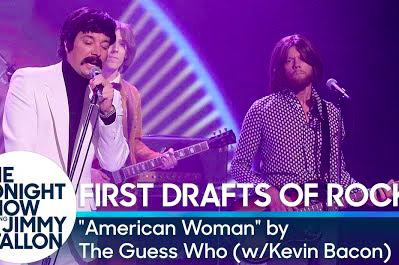 How about Jimmy Fallon and special guest Kevin Bacon performing a rendition of "American Woman" on Fallon's recurring "First Drafts of Rock" series. The five-piece in the video below really pulls it together for this cover. The wardrobes. The exaggerated facial expressions. The howling. There's just a minor difference in this version: All of the lyrics are changed to reflect people who hold pretty normal jobs in countries around the world. It's excellent work.